The Downtown Ferry Building was originally built between 1909 and 1912 to house the ferry terminal operations for the Auckland harbour. In 1982 the building was given a classification 1 rating as a historical site and later, renovations were undertaken to improve the structure and to move the terminal operations to the new buildings on Piers 1 and 2. At this time, a walkway was erected across the northern face of the structure to span the gap between piers. This walkway was supported by six reinforced concrete corbels fixed to the sea wall. Each of the six corbels has shown a considerable amount of deterioration and loss of strength in the years they have been in use. In 2012 BBR Contech was awarded the contract to carry out the rehabilitation of the six corbels through installation of a cathodic protection system and resizing the corbels with a 50% larger reinforced concrete encasement. The team completed the installation of both CP and concrete despite difficult environmental conditions and have achieved the levels of performance and quality required by the client. 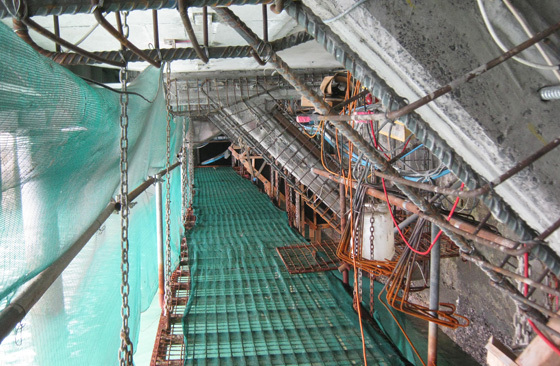 The new support structure is expected to have an increased life expectancy with the new Cathodic Protection assisting in the prevention of corrosion of the reinforcing steel both within the new and existing cages.